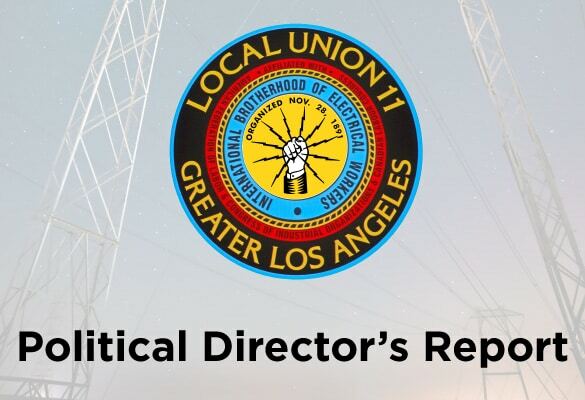 The California Labor Federation recently released the 2018 Labor’s Legislative Scorecard and I want to highlight the legislators from Los Angeles County that made the list. State Senators Steven Bradford, Ed Hernandez, Robert Hertzberg, Ricardo Lara, Connie Leyva, Holly Mitchell, and Anthony Portantino all had a 100 percent Labor voting record in 2018. On the State Assembly side, the list includes Ian Calderon, Wendy Carrillo, Ed Chau, Reggie Jones-Sawyer, Adrin Nazarian, Anthony Rendon, and Miguel Santiago. We must recognize that Los Angeles County sends many labor champions to Sacramento, and we have to continue that tradition. These legislators stood with working families to ban for-profit charter schools, expand collective bargaining rights, bring more compliance to skilled and trained workforce requirements, and protections for women in the trades. This year, our State Building Trades Council is stewarding bills that will protect workers against misclassification, apply prevailing wage worker protections to charter school projects that receive tax-exempt conduit bond financing from a public agency, and other bills. It’s early in the legislative year, so we’ll know more about the progress our bills are making during the coming months. Although this is an off year when it comes to local and national elections, the special elections due to resignations have kept me busy. We endorsed Jackie Goldberg for LAUSD Board District 5 – that run-off election is May 14th, 2019. In State Senate District 33, we endorsed Lena Gonzalez – that run-off election is June 4th, 2019. And finally, the special primary election for Los Angeles Council District 12 is also June 4th, 2019. There, we endorsed Jack Kayajian. I wish you and yours a safe Spring Break. Please remember that there is no shame in asking for help when you’re experience stress, anxiety or depression.